After making his way past a row of analog TVs, a group of mini fridges and a precarious stack of Bibles, Al Lackman stands inside Room 110 of the Trade Winds motel. With the mirrors gone from the walls and mismatched blankets folded on the room’s two barren full-size mattresses, it’s hard to tell someone used to live here. But someone did, says Lackman, until he evicted them last month. 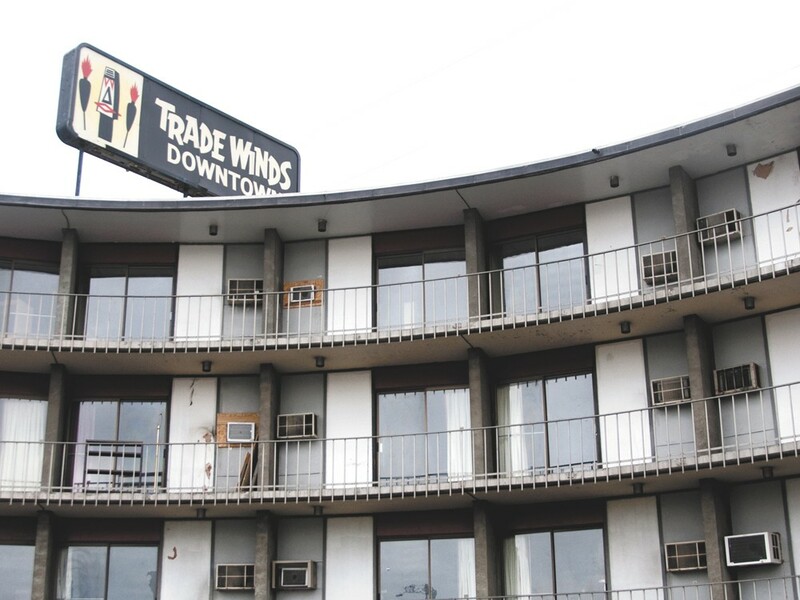 That’s because the Trade Winds motel — next to Interstate 90, between the fast food restaurants and car lots of Third Avenue — is locking its doors at the end of the month. Its 50-year lease is up and it’s no longer a profitable business, Lackman says. He’s a mix of apathetic and nostalgic over the motel’s fate, but says he’s worried about the 50 residents who were living there because they couldn’t find housing elsewhere due to low incomes or criminal records. There are about 1,300 homeless people in Spokane, according to the latest official count, but there is another group with just a toehold on shelter, housing advocates say. While housing programs exist for financial assistance or help finding a place, almost all of them have restrictions on criminal records and rental history. That can exclude people with felonies and bad rental records, even if they qualify otherwise, advocates say. Some programs are virtually inaccessible — the waiting list for federally funded Section 8 housing is years long in the Spokane area. And even if someone qualifies for a voucher program, like Section 8, they’re often using that assistance to rent from a private landlord and are still subject to that landlord’s rules, requirements and background checks. Neil Richardson, 57, had been staying at the Trade Winds for three years because it was the only place he could afford to rent by the month. That’s the cycle that keeps people struggling, says Mary Tracey, a longtime social services worker and development director at Transitions, a nonprofit that offers transitional housing and educational programs for women and children. Federal guidelines say that to adequately fund other needs, people should be spending no more than 30 percent of their income on housing. In Spokane County, 54 percent of residents are spending more than that, according to a 2011 report from the National Low Income Housing Coalition. Meanwhile, there’s been a big push nationally for “housing first,” a social service strategy that banks on a stable living situation to get people on the road to a better life overall. Tracey says more affordable housing is obviously key to getting people out of motels and off the street, but so are programs like the “Responsible Renter” curriculum, in which nonprofits in town teach people basic renting information and skills. Sometimes, she says, having gone through that program can earn a risky applicant a second look from a landlord. Lackman, who smiles a lot despite how tired his eyes look, understands the needs of the people who stayed at the Trade Winds, but his management of the motel has been driven as much by business as by compassion. Lackman says he started working for his father, who owned the motel first, when he was 15. But they started to feel the pinch during Spokane’s economic boom in the late 1970s. Every three or four years they’d see a new hotel move into town, taking business from them. Then, within a couple of years, they’d start to rebound just to see another hotel going up. In 1999 the company Trade Winds LLC purchased the land and the building, though the details of Lackman’s lease stayed the same. Dave Black, a managing member of the LLC, says the land is worth at least $1 million. Black says he’s talked to city officials about “improving” the area near the motel, but if that doesn’t happen he’ll upgrade the building and operate it as a short-term hotel. Though Lackman says he tried to contact the LLC about extending his lease, he wasn’t convinced he could turn the business around. Today, as the guts of the rooms sit consolidated on the main floor, ready to be sold or given away, he’s nonchalant even as he reflects on the motel’s legacy.